Retailer David Jones is adeptly Riding the waves of transmedia indignation (from both sides) with the applomb of a PR surf god. As embarrassing as the social media barbs at – and as spirited the defences of – Adam Goodes are, the alleged ‘PR Disaster’ actually helps DJs surf a swell of “controversy communications”, adding visibility for their new positioning campaign. The creative, Kanye, the role model sponsorships – and even the social spat – assert DJs new brand posture: ‘The right-on choice for cashed-up consumers with a conscientous rock ‘n roll spirit’, I’m guessing? Whatever the schtick, Goodesy’s (and others’) recruitment is an adept PR manouevre. Round 1, and both store and sports legend are countering with all the right moves. Unsportsmanlike actions – Gazza and Goodesy? I think it’s the somewhat disingenious or inauthentic lines we’re hearing from Adam Goodes that makes his media stance something of a personal PR kerfuffle. But he has many supporters. Adam is patently a high-integrity and high-values bloke, and I think we’ve just seen a little more of his humanity in two ways; A) by showing he is still sensitive to the barbs of booing, barracking buffoons and B) in neglecting to squarely, honestly address the reality of what he did on Friday night versus Carlton. Like his footy forefather – Paul Gascoigne – did all those years ago in a far flung land, Goodesy appeared to be trying to “noise-up” the opposition fans. Why not, given the abuse? But in these fields, the insult is usually in the eyes of the beholder; ask those outraged Celtic fans when accosted by the Rangers’ star’s cultural reference back in the late 90s. When passions are high – along with score discrepancies – trading on heritage is a risky strategy. 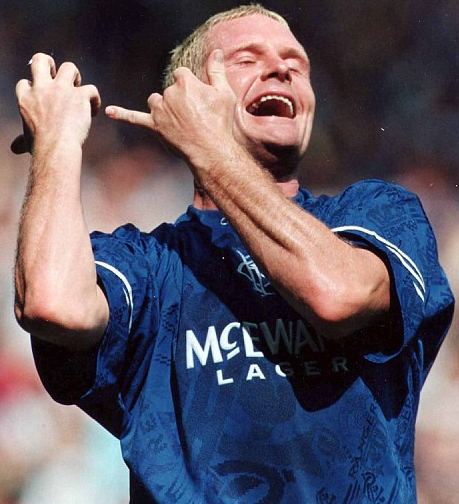 Ask Gazza, Adam (and congrats on a great goal).